BOOK NOW SUMMER DATES Available for Destin FL The Coral Cabana is our most popular 3 bedroom, 2 bath home with private heated pool(optional) & separate pet yard. A Street Legal Golf Cart is available for use. Please call for Pricing Details. BOOK NOW Summer Vacation in Destin, Featured Home is a 3 bedroom 3.5 bath home. Sleeps max of 10 guests, Rates based up to 8 guests, each guest over 8 to max of 10 is $105/wk pool heating and 6 psgr Golf Cart included. Perfect family hangout! This single-story cottage is equally ideal for couples or an entire family. Enjoy a private pool, a family BBQ or reading on the shady wrap-around porch or back patio. Pets will love the freedom of their own fenced backyard. Inside, cool tile, ceiling fans and AC keep you comfortable, while the many windows make this a happy cheerful home. An open-plan living area includes comfy couches and great entertainment: cable with 50 inch HDTV & Wi-Fi. The dining area, large breakfast bar, and fully stocked kitchen make entertaining that much more enjoyable. Details, comfort and beach proximity make this an ideal and popular vacation home. 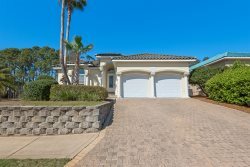 The beach is just a few minutes’ walk or golf cart ride down the private drive. This home is one of three homes on a private cul-de-sac (Pineapple Cabana, Banana Cabana and Coral Cabana), no through traffic, close to Kenny D’s, Capt Dave’s on the Gulf and The Crab Trap restaurants on Old Scenic 98..
Rates are based on 6 guests, additional guests over 6 to a maximum 8 is $105.00/wk per person plus taxes. Children under age 2 are not included in the guest count. Check in 4:00PM Check out 10:00AM. Rick and Debbie were so great! They genuinely cared about making our stay the best possible! The house was in beautiful condition and felt like home the minute we entered! Easy to reach and friendly. We found the property well kept and surprisingly quiet. Great place for pets. Always a great experience working with the team and like the name implies, you are on Easy Street! Coral Cabana is one of the nicest properties. Fully stocked with everything we need and pet friendly. Love the short walk to the beach but also love how quiet and private it is on the little "block" the houses are in. We loved the house, pool and location. It was off the main road and pretty private. We had everything we needed inside as far as amenities and supplies. They really were fully stocked. Our dogs even had a great time and plenty of area to be outside. Destin is a beautiful area and we really enjoyed our week vacation there. Rick & Debbie are the definition of customer service, hospitality and professionalism. Rent from Easy Street Vacation Rentals or you are missing out! My 10th year staying at Coral Cabana. Like home away from home! Billy was great to schedule a new rental for us when Beachinit was taken off the program by the owners. The new rental, Coral Cabana, was better than we ever expected. Thank you Billy for all your assistance. The beach house was so beautiful and the beds were so comfy. My favorites were the private pool and the proximity to our private beach. My nieces and nephews loved the golf cart. All in all it was one of our favorite vacations. Thanks for such a clean and accommodating beach house! We will definitely stay with Rick and Debbie again. Rick and Debbie Scali were gracious, welcoming, and made our vacation an easy experience! Perfect vacation! It was our second stay at Coral Cabana. We highly recommend Easy Street Vacation Rentals. The house was clean, well-maintained, and well-stocked. The fenced yard was perfect for letting our dog run around outside.The house is an easy walk from private beach access. We loved using the golf cart to get around -- fun and easy! Especially loved having a private pool! We will definitely use Easy Street for our next Destin vacation. I love renting from Rick & Debbie this was my 9th year and I always feel like family when I stay. they are both so friendly and welcoming. Love staying at the Coral Cabana like my very own vacation home after renting for 9 years and going from Rick & Debbie. Our 2nd stay there and it has everything we need! Coral Cabana, our Favorite Little Piece of Paradise. This is our Second Year staying here and we consider this a "Home away From Home". The Quiet Area and Private Pool makes for a Wonderful Relaxing Vacation. Our Fur Babies love the Yard and we can Relax knowing they are Safe. We have Already Booked for Next Year. Our Family has Decided this is our "Forever Vacation Destination"
Already booked for our 3rd year. Everything about this experience was professional, impeccable and fantastic. All information was disclosed properly,Billy was great. The pool crew was very nice. Even the crew who left the new clean linens at the end of our stay was very courteous. Mrs Scali was very professional and sweet. I can't find enough good words for this experience. From the owners and staff, to the property itself. The house was amazing and exactly as picture. Very clean, very organized and it had all that was needed. Beautiful place, excellent location. It was great to have a private pool and with the heating option. I was very happy I was able to take my 2 dogs, as they are old and did not want to leave them boarded. This made my vacation stress free and it made me feel like home. Thank you again for such a wonderful vacation and I will definitely recommend you and will stay again. Thank you very much Rick and Debbie, we had a very relaxing vacation stay and you were so helpful when we arrived slightly ahead of schedule. Will plan on coming back and recommend you to others! Spectacular customer service and professionalism. I will always rent from Easy Street Vacation Rentals anytime I am in Destin. I have rented from Rick and Debbie for the past 8 years and it just gets better and better. House was spectacular! Love the private pool and separate yard fro my pups. Perfect floor plan for my needs and love having the grill there so so I can grill when I am there too. This is our 4th year renting with easy street. Rick has been more than accommodating each and every year. This was our first year at coral cabana. Home was very roomy. We travel with our 93 yr old father and the one level/no steps house was great for him to get around. Block from beach and the golf cart is a huge plus. Spent lots of time at our pool. Lots of restaurant choices. Defintely would recommend McQuires Irish Pub. Great food! And at the end of the day the crisp white bed linens were so comfortable ;) Looking forward to booking again with easy street next summer. Very Friendly and Informative, when I booked the trip this year and already booked for next year same time. Thank you for a wonderful experience with our Family Vacation. Your Little Slice of Paradise was amazing and we made so many memories. Loved the Coral Cabana! I'll definitely be back next year! House was modern, beautiful, clean, bed comfortable just a fantastic house to stay in when in Destin. We enjoyed our stay. Everything was perfect! Great location, close to great restaurants and shopping.